No grail? Tell me that you at least got me a mummified crocodile. You should have gone to the Moroccan street market and bought your Holy Grail. You could have gotten three with a 20% discount. It's not too late to try for food poisioning and getting robbed... As they say, "Dare to dream and dare to put actions behind those dreams." don't worry - once you return home to the United States and you are poor from being unemployed, you will quickly feel robbed from being so broke. and after eating a month's worth of cheap dollar menu items from fast food joints, you are sure to get food poisioning. then you will look back on your trip as the "holy grail" - see all will work out in the end! Maybe author is your next job description! I have enjoyed your writing and will miss checking in to read up on your latest adventure. 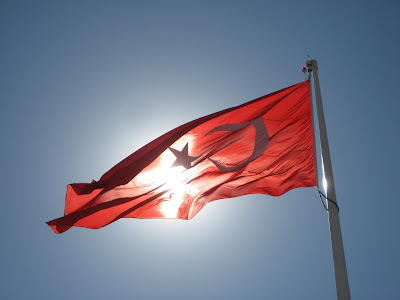 Aha..It s a wonderful a picture.This is our flag,National Turkish Flag. who knows,how many people died for this flag..